The Stimulite On Top Cushion can generally be categorized as a hybrid cushion due to its dual foam-base honeycomb-top structure. Supracor - the manufacturer of this product - specifies this cushion as follows. The extra cover option refers to purchasing a Stimulite On Top Cushion and the extra polyester cover at the same time (not separately). If a custom taper, rail, notch, or leg cut is desired, complete and return the Custom Cut Stimulite form. Note that the back two corners are already inset a bit in Supracor's standard Stimulite-On-Top cushion geometry. 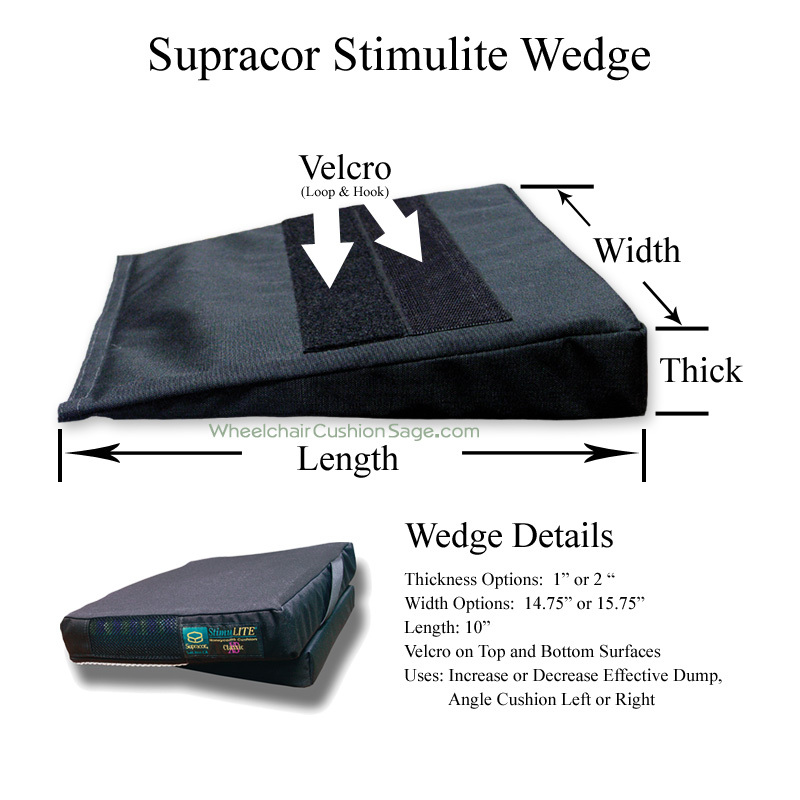 The Stimulite On Top Cushion is the first hybrid cushion introduced by this manufacturer—Supracor. 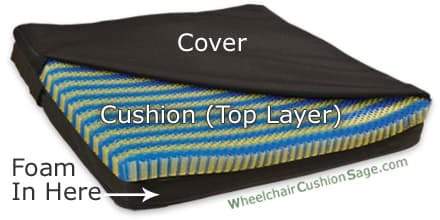 The "Stimulite On Top Cushion" model exhibits a dual compartment cover wherein is; essentially, two different cushions—a honeycomb cushion in the top compartment (the top layer) and a foam cushion in the bottom compartment (the bottom layer). In the cushion cover's top compartment, the cushioning material is the same perforated, thermoplastic polyurethane honeycomb structure as Supracor's other Stimulite cushions. The cushion's top compartment is pourous for enhanced breathability. In the cushion cover's bottom compartment, the cushioning material is a medium density foam. The top surface of the foam base material is slightly contoured which; when the cushion is being sat upon, produces a similar contouring of the honeycomb layer on top. The cushion's bottom compartment is fluid proof so that the foam base material is not affected by incontinence issues. The manufacturer has introduced this cushion as a less expensive alternative to its fully-honeycomb cushion models. To a lesser degree, Supracor's Stimulite On Top Cushion model exhibits the superior breathability of Supracor's fully-honeycomb cushions, while still exhibiting greater breathability than typical foam, gel/fluid, and air cushions. In this case, the Stimulite On Top's hybrid design approach is both economically helpful to those who cannot afford a fully-honeycomb model, and functionally helpful to those who need a good cushion but do not need the greater breathability factor associated with Supracor's fully-honeycomb cushions.